With all the Suckswuh-related blogging and Flickring and podcasting permeating the internets this week, it almost seems like actual attendance is optional. This is, of course, not true. While one may attempt to live vicariously through a feed reader and a photo stream, it’s a poor substitute for actually being there. It’s been said before (and I’m about to say it again) that SXSW isn’t really about the content, it’s about the community. Sure, I went to the daytime programming, I listened to the panels and presentations, even took a few notes. It was overall educational and informative and thought-provoking. Even the stuff I already knew was worth hearing again, a nice refresher, a mental reboot to remind me of why I do what I do. But really that stuff is just a convenient excuse for a few thousand geeks to be sociable. “Hey let’s have this huge week-long party in Austin every year, and we can even legitimize it by wrapping it around some kind of conference thingy!” Sounds like a plan. The annual South by Southwest Interactive conference is spring break for geeks. A predominantly social affair, a chance for webby types to venture out into daylight and crowds and meet each other face to face in celebration of our thankless passions. It’s Geekstock. So I’m not even going to cover the conference programming in this obligatory retrospective. That portion is largely incidental. I’m not going to journalize the bits that everyone else has already attempted to journalize. No, this is pure self-indulgent anecdotalism, a semi-chronological account of some of my own thoughts and experiences now that I’ve had a few days to process them. Thursday the 9th of March I set out via transport service to Oakland International Aiport. Last year, my initiation into the SXSW cult, I had been intending right up to the last minute to take public transportation to the airport. This requires catching a shuttle bus from my apartment to the nearest BART station, a train ride to the Oakland Coliseum station, and catching another shuttle to the airport. Factoring in wait-times, the trip is well over an hour. But as I was packing around 2AM the night before, Jolene convinced me to just splurge on a car service and save myself the headache (and get an extra hour of sleep). I picked a likely company from the Yellow Pages and got some poor fellow out of bed to arrange my 10AM pickup. He arrived punctually 8 hours later, took me straight to the terminal in 25 minutes, and charged a mere $12 though I was the only passenger in the van. I paid my driver, who was courteous and professional, and walked away. Not 10 paces from the curb I realized I really should tip the man, and turned to walk back and slip him a generous gratuity, but he had already driven off. A year later and I still feel like a heel for stiffing him. So of course I can never use that transport service again. This time I hired BayPorter Express, paid double, and still tipped well. Karma, baby. In the airport waiting corral I spotted MJ typing on a Powerbook, listening to an iPod, and munching what looked to be sliced cucumber. I’d met MJ once or twice at other events but we’d never really conversed and I didn’t know if she would remember me. So I gave her the spooky staredown, waiting for her to look up, perchance to make eye contact and spot a glimmer of recognition so I could have someone to chat with before boarding call. Her eyes did cross me once, briefly, and either she didn’t notice me, didn’t remember me, or didn’t like the spooky stalkerish stare I was giving and quickly looked away. I have that effect on women. A group of us, led by the purple-haired and effervescent Ms. Jen, voyaged overland to a Whole Foods megacenter where I paid $5 for a small cup of the best damn pineapple chunks I’ve ever had in my life. No bourbon in them or nothing. The plans for Friday evening included a dinnertime meetup with a bunch of visiting Australians. As SXSW continues to expand exponentially in scale and scope, it also becomes an increasingly international crowd. This year’s BritPack was at least triple the size of 2005’s, and the Aussie representation quadrupled. We even had a few notable Belgians in attendance. Our group quickly outgrew the capacity of the tiny wedge of restaurant space we had claimed, but no matter, we just squeezed in closer together. One’s personal space contracts appreciably at Suckswuh. This underestimation of venue capacity would become a repeated theme in the next few days. I lived for a time in Houston before moving to the San Francisco Bay Area in 2000 to partake in the final months of the dotcom bubble. I don’t like Texas. It’s hot and muggy and the bigoted rednecks are far too numerous for my tastes. But there are still plenty of things to like about Texas, and even some things I miss. One being barbecue. Real barbecue, not just grilled meat drenched in bottled sauce. One cannot find proper barbecue in California, only in Texas or perhaps Kansas City at a distant second. At last year’s SXSW I didn’t have the chance to indulge in real Texas barbecue, so this time around I wasn’t going to let the opportunity slip by. I lunched twice at the nearby Iron Works and could have easily gone a third or fourth time. I am not built for serious walking. Oh I can do it, but I don’t care for it and usually avoid it. By the second day (the first official day of the conference) the previous day’s long hike to Whole Foods had already taken a toll in the form of great soreness and a respectable blister on my toe. My feet hurt like hell and I didn’t want to walk any more than I absolutely had to. Then someone, I know not who (curse you, Derek! ), had the idea to just walk to the Frog Design opening party even though a shuttle bus was available. So a moderately long haul (I’d guesstimate about 2 miles?) had my dogs barking loud. The joint was packed, and not entirely peopled with web geeks — lots of film festival attendees and plenty of townies were there. It was lavishly hip, complete with go-go dancers who, thanks to some mixup with booking the DJ, had little to do all evening except wander around being fabulous. At one point I spotted Heather Armstrong passing by, and in an unusual fit of extroversion I shouted “Hey, it’s Dooce!” She turned, I immediately felt like an idiot, introduced myself as a reader and a fan, and she, in a display of humble sweetness, actually introduced herself with a “Hi, I’m Heather. Nice to meet you.” Of course I know you’re Heather, everyone here knows you’re Heather, there’s no need to introduce yourself. But that’s what you’re supposed to do when meeting someone new, and it was nice to see that her celebrity seems as bewildering to her as it is to me. Kudos on the unswelled head, Heather. It was a pleasure meeting you too. Afterwards was the inaugural South by Northwest, a party thrown by the good folks at Blue Flavor. It was held in a back room at the Iron Cactus, and was very crowded. When asked, Flavorist Keith Robinson said they anticipated perhaps a third of the final number that showed up. That little room was positively packed to the portholes with geekflesh. Somewhere in that teeming mass was Patient 0, the carrier of the headcold that myself and others came down with later. One of the very few advantages to having almost no human contact from day to day is that I rarely catch colds. Then I attend a conference and shake a lot of strange hands and get compressed into spaces densely packed with biology. I caught a cold at Web Design World San Francisco, and now, despite daily doses of Airborne and regular Purelling of hands, I had caught a cold at Suckswuh. Which is just as well, since a night in the hotel gave me a chance to rest my weary soles. The virus persisted over the coming days, and is still with me as I write this on my third day home. Out of consideration for others, I attempted to minimize personal contact with anyone for the rest of the conference. No more handshaking if it could be avoided. At the Adaptive Path party on Monday night, I ran into MJ again, who had been busily tagging people in her own unique way. I was targeted for a smack, but because of the cold I attempted to decline cleverly. I’m not especially clever, so my remark that “my mom might see it” probably just came off as lame an insulting. So yeah, I totally and inadvertently dissed MJ. She’ll never speak to me again. I have that effect on women. 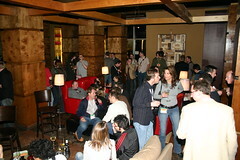 The closing party this year was sponsored by Media Temple and was held at a club downtown called The Foundation. It was vastly superior to last year’s closing party in every way. The American Legion Hall, basically just a stuffy old house. The Foundation, a groovy hipster nightclub. Somewhere on the outskirts of town, taxi required. A few blocks away from the center of town, walking distance from most conference hotels. War memorabelia and things with antlers. Industrial sculptures, funky tile mosaics, stained glass candle holders. None. I think there was a radio in one upstairs room. Some kind of funky jazzhouse fusion pop. Free keg of Miller Lite on the lawn, limited paid mixology in the kitchen. Full open bar, anything you like. It was a really good capper to the week’s festivities. Good times had by all. The following morning was the final Hampton breakfast, time for final goodbyes and best wishes and promises that we wouldn’t wait another year to contact each other. Everyone was exhausted yet energized at the same time, a mix of sadness and joy. There’s a mist that hangs in the air after South by Southwest, a personal tagcloud of the people we’ve met and experiences we’ve shared. As that mist slowly dissipates it gives way to a strange post-partum depression when one must face the fact that it really is over. Decompression is required, a period of readjustment and reflection. And rest. I slept for 13 hours the night I returned home, and haven’t set foot outside my apartment in three days. My feet have recovered, my biorhythms have reset, my sinuses are showing signs of clearing. Now it’s time to pick up where I left off, to return to the workday routine, to try to make good on some promises, to put into action some new ideas. I was a different person for a week, and now it’s time to socket aspects of that other personality into the person I am the rest of the year. And to begin planning for Suckswuh 2007. This was posted on Saturday, March 18th, 2006 at 4:48 pm	and is filed under General Geekery, Personal. Comments closed, no pings allowed. Sounds like you had a blast Craig….good for you!! Was there much on AJAX at the conference? Try as I may to remain unFlickred, people just keep pointing cameras at me. If you go to SXSW just accept that you WILL end up on Flickr, there’s no fighting it. 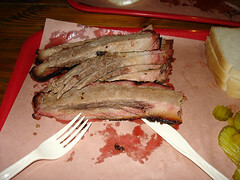 Iron Works has pretty good brisket, though I’ve had better. I didn’t get to try their pork ribs, which is the second One True Barbecue. There were one or two sessions covering Ajax, but I didn’t attend them. I think Ajax is already becoming un-trendy, at least among people who know how the web works. Marketroids are just now starting to hear about it and run to their dev teams with starry-eyed wonder, asking for Ajax. But smart developers have received the message that “just because we can doesn’t mean we should” so we’re seeing more responsible and practical uses of Ajax and effects libraries instead of old-school Flashturbation abuses. If there was any one dominant theme at SXSW this year, it was the whole “Web 2.0” thing, the new attitude about building applications and services, and adjusting business models to match. People are excited about the web again, and this time the movement is being led by folks who actually DO something instead of marketroids and venture capitalists who think the web is just another flavor of television. You’re right. I will *never* talk to you or your mom ever again. Seriously though, that Mom line was purely… genius. Or something. Hey Craig, I have to say quality photo to round the post off with :-) I never got a picture of a sticker with Austin in the background. And I never did feel brave enough to wear my shirt … ‘cos I just couldn’t be sure where those stickers were placed. I might just as well have walked around with the word ‘vandal’ on it!